My experience is limited, and I certainly don't consider myself to be an expert, but I can tell you what works for me at "my" creek. Bear in mind that it is located at the bottom of a deep ravine, with fairly heavy foliage over it, so it's quite dark unless a shaft of sunlight makes it through the trees. 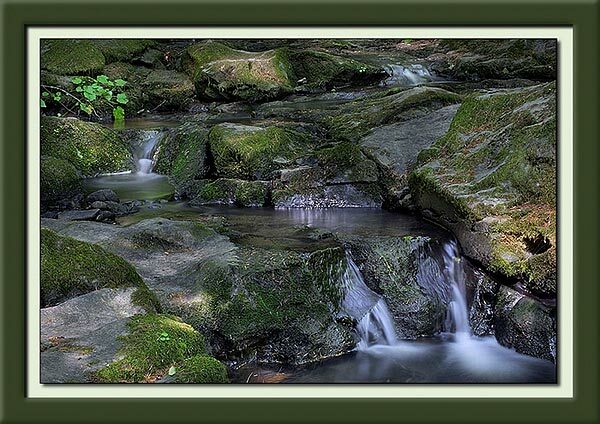 I've shot the waterfalls when the sky is overcast, and when there is sunlight illuminating spots on the forest floor. Each has its advantages: the spots of sunlight add excitement, but also difficulty, because of the high contrast. When there are spots of sunlight, I pay attention to the bright areas, checking my histogram to make sure that they aren't blown out. I usually bracket my exposures, because the "white water" can burn out, as can any areas lit by the sun. When sunlight is hitting the water, reflections can be a problem. 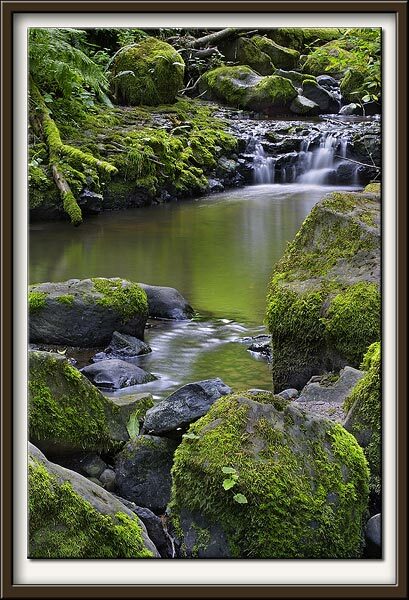 If your waterfall is in bright sun, you can use a Circular Polarizer (CP) to minimize reflections. When there are spots of sunlight, I analyze the scene to see where I'd most like the light to fall, and wait for the earth's rotation to make it happen. Sometimes, though, the light just won't hit where you want. I managed to catch some light on the two upper falls, but it just missed hitting the lower falls. I usually use the 50mm lens, although for shots like this one where I don't need much DOF, I occasionally use a 300mm. 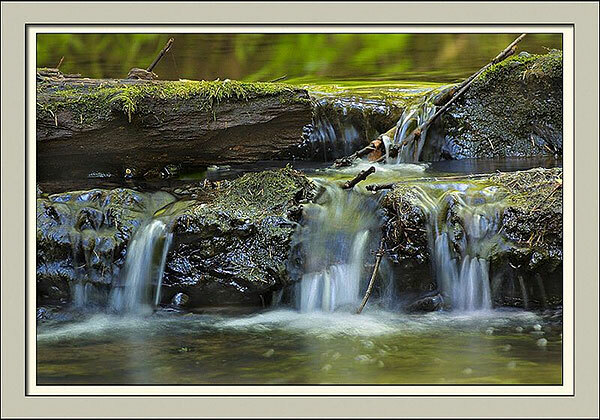 Shutter speed is an important consideration for waterfalls, as it affects the "softness" of the water. Too fast a speed will "freeze" the water, and too slow a speed may result in a burnt-out, white blob. For the "big picture" shots, where I need a lot of DOF, I use an aperture of f/22. That, along with the darkness, often results in shutter speeds of 1.5 to 3 seconds. This is much longer than some people recommend, but I've been happy with the results. This is a scene that required a deep DOF, because I wanted to include the foreground rocks to "put the viewer in the scene." Fortunately, this waterfall is in one of the lighter areas of the forest, so the shutter speed didn't have to be too slow. The waterfall is pretty soft-looking, but I liked the look. For shots where I don't need so much DOF, I can use a larger aperture (smaller number) to get a faster shutter speed. I also have the option of increasing the ISO to allow faster shutter speeds. 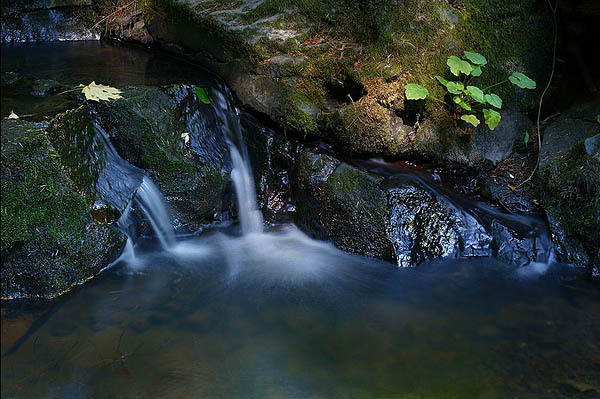 Some people use graduated Neutral Density (ND) filters for waterfalls, rotating them so the "dark" area of the filter covers the waterfall, allowing a longer exposure without burning out the water.